Knocked-out French heavy tank Char B1. On 10 May 1940 the German offensive began by outflanking the Maginot Line in an advance through the Ardennes region, a move totally unexpected by the Allies. Once knocked off-balance France never recovered and despite brave and sometimes effective counter-attacks, German tactics, troop training, morale and much military equipment proved decisively superior. After a campaign lasting less than two months France was forced to sue for peace and an armistice was signed on 22 June 1940. Under the terms of the armistice, in the unoccupied zone of France those forces that remained intact were rapidly demobilized except 100,000 men who were to maintain order (l’armee de l’ armistice). The French fleet and colonial forces were to remain intact for the time being. Total casualties amounted to 290,000 men killed or wounded and 1,900,000 taken prisoner. A large number of men had succeeded in escaping to the colonies, however, and many had been evacuated to England. There was one redeeming feature in this massive defeat: the performance of the French forces on the Italian border, where 185,000 men (in three divisions and various garrison forces) under General Olry completely halted the Italian attack of 20-25 June at a cost of 37 killed, 42 wounded and 150 missing (Italian losses 4,000 men). 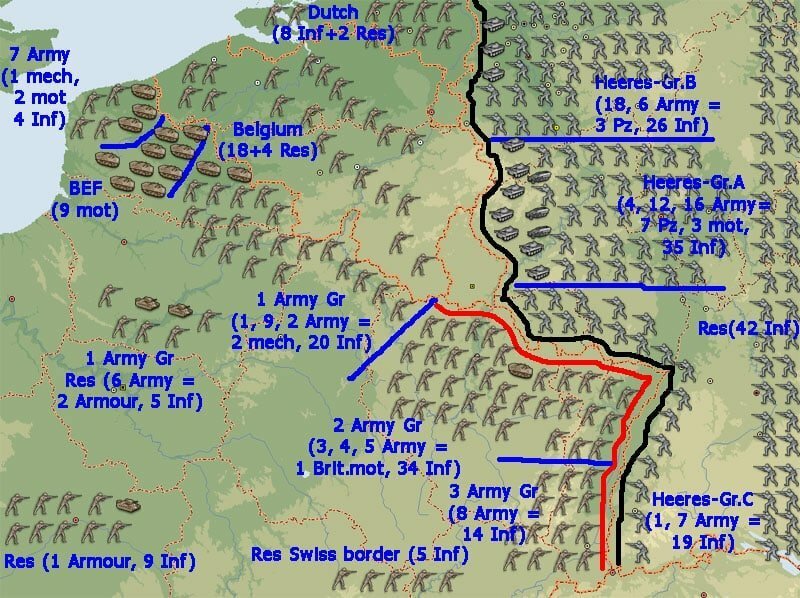 In May 1940, the French Army on the north-east front, which stretched from Switzerland to the North Sea, was divided into the 1st and 2nd Army Groups and the 7th Army. The general reserve comprised a further 17 infantry, 2 motorised and 3 armoured divisions. Deployment Western Front in May 1940. The backbone of the French Army was the infantry which, apart from increased firepower, was in organization and training, very similar to that of World War I, and still relied on horse transport to a great extent. The basic French infantry division had provided a model for those of many other countries, and consisted of a divisional headquarters, three infantry regiments, two artillery regiments, and a reconnaissance group of 4 squadrons: headquarters, motor-cycle, horse and weapons. The French heavy tak Char B1, at the beginning of WW2 one of the most dangerous and powerful tanks. 365 Char B1 were built until the surrender. Armour: In May 1940 France had over 3,000 tanks, and in terms of numbers, quality and firepower they were generally superior to those employed by the Germans. Tactically, however, the French were definitely inferior, and with one or two exceptions the handling of this valuable force was uninspired and wasteful. The basic armoured unit was the tank battalion, comprising a staff, three tank companies and a reserve company (in all, some 45 to 60 tanks). There were 39 tank battalions in 1940 and for tactical purposes they were twinned to form tank battalion groups. At the outbreak of war only five battalions had received the latest tanks (the Somua S-35 and Char B-1 models) while the rest still retained a variety of modern and semi-obsolete types. In addition to the battalion groups there were also 11 independent tank companies. Between January and May 1940, four reserve armoured divisions were formed and placed at the disposal of the General Headquarters. These divisions absorbed a number of the above-mentioned tank battalions and companies. Armoured fighting vehicles were also to be found in the cavalry divisions undergoing mechanisation, in five light cavalry divisions which were also still not completely mechanised, and in the reconnaissance groups. All these formations combined horsed cavalry, motor-cycle troops, armoured cars, tanks, and infantry mounted in cross-country vehicles. Colonial Forces: Troops from Algeria, Morocco and Tunisia counted as part of the metropolitan army, and North Africans made a large contribution to the French Army. The 12 North African infantry divisions were each composed of three infantry regiments and one artillery regiment. They included regiments of the French Foreign Legion, Zouaves, and Moroccan, Algerian and Tunisian tirailleurs (light infantry). Three Brigades of spahis from Algeria and Morocco fought with distinction before retreating to the unoccupied zone of France. French colonial troops came under the control of a special directorate of the Ministry of War, and were stationed partly in the colonies and partly in, France. Their commandant had the status of regional commander and was appointed Senior Commandant of Colonial Troops in France. The designation of formations as ‘colonial’ meant either that it had been raised in France to serve in the colonies, or that it was composed of native troops from the French Empire. 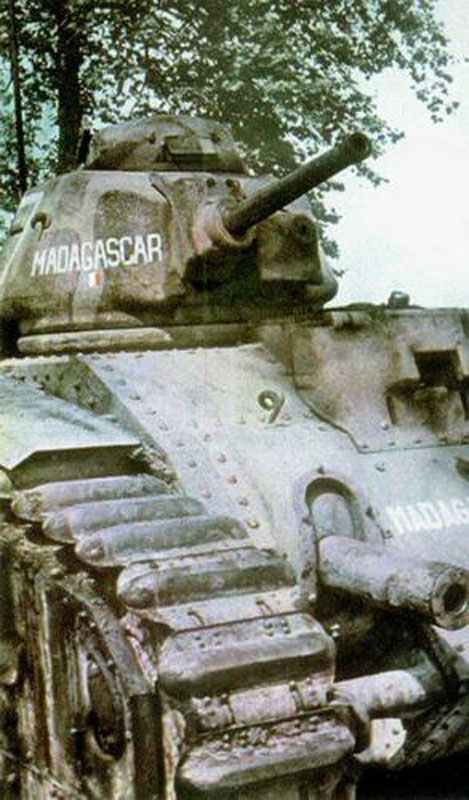 In May 1940 there were 9 divisions of colonial infantry, while in the 102nd Fortress Division there was a demi-brigade each of Indochinese and Malagasy machine gunners helping to man the Maginot Line. In addition a number of metropolitan divisions had been brought up to strength by the addition of non-metropolitan regiments. NCOs, Privates 17,000 ? ? Total men 17,500 ? ? Machine guns 514 (168 heavy, 346 light) 160 (48 heavy, 112 light) ? Mortars 51 (27 light, 24 heavy) 7 (9 light, 8 heavy) ? Anti-tank guns 49 (43 x 25mm, 6 x 47mm) 9 (25mm) ? Motor vehicles ? ? ? Howitzers and Field guns ? ? The Dewoitine D520, the best French fighter of WW2. In May 1940 101 were delivered and by June the output had reached ten per day. This fighter was credited with 147 kills for the loss of 85 fighters and 44 pilots. The Air Force had suffered considerable neglect between the wars, and its performance in 1940, with machines which were in general much inferior to those of the enemy, was not impressive. Indeed, according to French sources, only 420 modern fighters and 31 heavy bombers were serviceable when the Germans struck in May. Total French front line strength on 10 May 1940 was 1,604 aircraft (764 fighters, 260 bombers, 180 reconnaissance planes, 400 liaison aircrafts). Total strength of the French Air Force together with Aviation Colonaile: 1,200 fighters, 800 reconnaissance planes, 1,300 bombers.